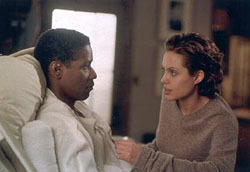 No special reason to rent this middling serial killer non-thriller unless you have a penchant for Washington or Jolie, both of whom give their usual noteworthy performances - Denzel especially, since he does all his acting confined to a hospital bed. It's time to hold a wake for the tired clichés of the serial killer thriller. In fact, it's time Hollywood put the whole genre to bed. I say, from now on, unless a director can promise to at least give "Seven" or "Silence of the Lambs" a run for their money, no more of these pictures should be green-lighted. These movies, in which gifted cops track the grisly murder sprees of guiltless psychotics through gritty urban landscapes, have become as standardized as their low-brow cousin, the slasher flick. Many of them exploit women as helpless victims while pretending to empower them through the fortitude of an intelligent female lead. Most of them feature some kind of isolated, criminologist sage who guides the investigation and a killer who leaves unnecessarily complex calling cards. And nearly all of them jettison their mock intellectual intentions in the last reel for a red herring suspect and a prefabricated finale in which the killer comes this close to killing one of the heroes before being shot -- half a dozen times and usually at point blank range -- by someone whose hands shake when they hold a gun. Color "The Bone Collector" guilty on all counts. The movie stars Denzel Washington as Lincoln Rhyme, a famous New York City forensics cop (and true crime textbook author) sidelined by an on-duty accident that left him almost completely paralyzed and prone to seizures that have him contemplating assisted suicide. But thanks to a bedroom full of high tech gadgets, he still serves as a consultant on tough cases, which is how he gets involved with Amelia Donaghy (Angelina Jolie), a savvy, street-smart beat cop who discovers the first victim of a ridiculously meticulous killer who enjoys leaving wildly complicated puzzle-clues at the scenes of his crimes. The bed-ridden Rhyme (rapper Queen Latifah plays his nurse) takes a shine to Donaghy and convinces her to become his pupil, because apparently in the four years since his accident the NYPD hasn't found any other competent forensic cops. Rhymes insists that she gather all evidence in the wake all this psycho's crimes while our invalid coaches her on procedure through on a radio headset, allowing them to form a unique bond that blossoms further in person. Even virtually immobile, Washington is great actor and lends the picture credence, even when his double-espresso Sherlock Holmes-ing gets a little too far out to be believed. Instantly recognizing turn-of-the-Century plumbing supplies and knowing exactly where to find them (and by extension the next victim) in the bowels of Manhattan? I don't think so! But Washington makes us buy it and director Phillip Noyce ("Patriot Games," "Clear and Present Danger") does manage to keep "The Bone Collector" respectable throughout most of its running time, maintaining tension without going too far overboard on the gory visual details of what this killer does to his prey as he taunts Rhymes with evidentiary enigmas that he races against time to solve before each victim's demise. The stunningly talented Jolie ("Gia," "Pushing Tin") is just as strong as Rhymes' reluctant but Brooklyn-tough apprentice, who has a nose for this work but not the stomach. These two captivating leads pilot the movie through a minefield of logical blunders and clichés that result from screenwriter Jeremy Iacone's attempts to simplify the wildly complex Jeffery Deaver novel on which the film is based. But eventually Iacone succumbs to his inner hack (he wrote the screenplay for "One Tough Cop," which was nothing but clichés) and once the killer is revealed (it has to be someone in the cast, of course), the entire movie ceases making sense and becomes so insultingly generic that it ruins everything good that came before it.